maintains a level of sales professionalism that you would expect from any jeweler. only gives his professional input, but his personal input on your decision using his years of experience. love will always make our ring and band unique and special. affordable, you are wrong! Call Mike Smale and he will make your dreams come true at an affordable price!! program you use. It really gave that "perfect"
hand visuals also helped the process. with the results. I would recommend Mike " VERY HIGHLY" for QUALITY and CUSTOMER SERVICE. recommending Mike to any bride and groom to be. that it is unique, not something off the shelf at a jewelry store. return for future jewelry needs. 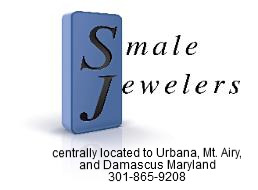 find...Self-explanatory to choose Smale Jewelers! a few pictures and some description of how I wanted the ring to look, he set to work right away. come true at an affordable price!! I truly appreciate the care and expertise you demonstrate in your work. ring (though as expected the more work required to design the band, the higher the price). *Not responsible for pricing errors on this site or the showcase. Prices subject to change without notice.